Today we’d like to introduce you to Stefanie Farrell. Stefanie, let’s start with your story. We’d love to hear how you got started and how the journey has been so far. I graduated high school in 1991 with absolutely no idea as to what I wanted to be or do. A guidance counselor introduced me to her daughter who happened to be a court stenographer. She believed that introducing us might provide me with some idea of a potential career path to consider. 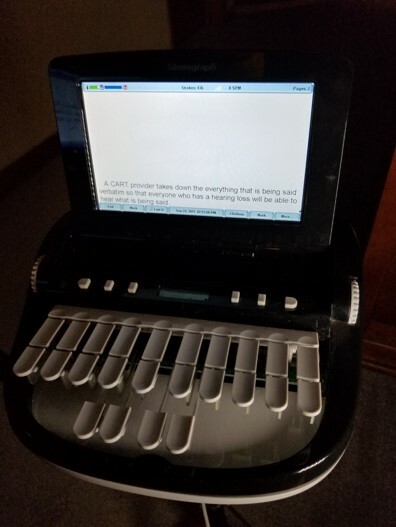 So, I met with this stenographer and found that I was intrigued and thought “why not?” I went to Massachusetts Bay Community College in the fall of ’91 to enter what was, at that time, the only Court and Conference Reporting Program in the Commonwealth. Court Reporting school was a challenge. The expectations were high. I was looked down upon due to the belief that I did not have the discipline at the age of 18 to put in the time and effort that it would take to graduate and be successful. That gave me the drive I needed to prove the naysayers wrong – which, happily, I did. My goal was to be an Official in Federal Court. I wanted to be that stenographer taking down the transcript at some huge trial one day. That plan, fortunately, went sideways. While I was finishing up my last six months of schooling, a Professor approached me and said we would like you to work with a student with hearing loss to provide verbatim captioning – a service which, today, is called Communication Access Realtime Translation or CART. I was always ready for any challenge thrown my way, so I accepted the assignment and provided live CART for a student in a Basic English class. Those 6 months solidified for me what my career path and goals were going be. I wanted to provide CART for as many persons with hearing loss as I possibly could. I loved the idea of being a gateway for someone to understand everything that was happening within a classroom, within a meeting, in a workplace – wherever a person needed to be able to ‘hear’ what was going on around them. Since August of 1994, I have been providing CART in an enormous variety of settings. I love my job. I love the people I meet. I wake up every morning with a purpose and that purpose is to provide the most accessible and best communication access possible. The biggest struggles were getting through school and being able to graduate at the required 225 words per minute with 98% accuracy. For those who have never used CART, it may seem like being fast OR being accurate is good enough; when someone is sitting next to you and depending on your ability to accurately capture even the fastest speakers, the accuracy of the text is just as important as the ability to keep up with fast speakers. Stefanie Farrell CART Provider – Communication Access Realtime Translation Services – what should we know? What do you guys do best? What sets you apart from the competition? There are, of course, several ways to measure success. One of them is financial – and I cannot deny that being a CART provider, despite the many challenges it brings, has enabled me to be a successful self-employed professional for over twenty years now. What I consider my biggest success story is that I have managed to support myself and my son while also providing a service that has literally changed other people’s lives by providing opportunities that were undreamed of just several years ago. To this day, I meet people who have never seen CART before, and it is as much a miracle for them to see what I do as it is for me to see the joy in their ability to participate in an activity they may have thought they were forever cut off from simply because their hearing became worse. My career has also affected me in other ways – for example, it allowed me to meet my husband, who uses my services from time to time as a person with a profound hearing loss himself. It has also made it possible for me to meet important social, political and economical players that feature prominently in today’s headlines, and I’ve learned many things while on the job which I probably would not have even been aware of otherwise.